Please remember to bring along your member card. And don't worry, we will be on rain, hail or shine! - Enter via Gate 5 on Langs Road, Ascot Vale. Parking is $15 on-site. - Bus No. 472 (Williamstown to Moonee Ponds) stops along Langs Road. - Bus No. 404 (Footscray to Moonee Ponds) stops on the corner of Epsom and Ascot Vale Roads. - Enter via Gate 1 on Epsom Road, Ascot Vale. - Route 57 tram (West Maribyrnong to Elizabeth Street, City), stops at stop 32 (Showgrounds Village Shopping Centre on Epsom Road). - Take the Craigieburn line to Newmarket Station, then catch Tram No. 57 away from the city to Showgrounds Village Shopping Centre (stop 32) on Epsom Road. Gate 1 is a short walk from this tram stop. - Voluntary gold coin donation on entry with profits being donated to EFC’s community programs. - The entire playing group will be onsite for a team presentation and new guernsey number reveal from 11am-11.30am. - Players will be in marquees for fans and members to gather signatures from 11.30am – 1pm. - The team will be split into five groups with nine players in each group. 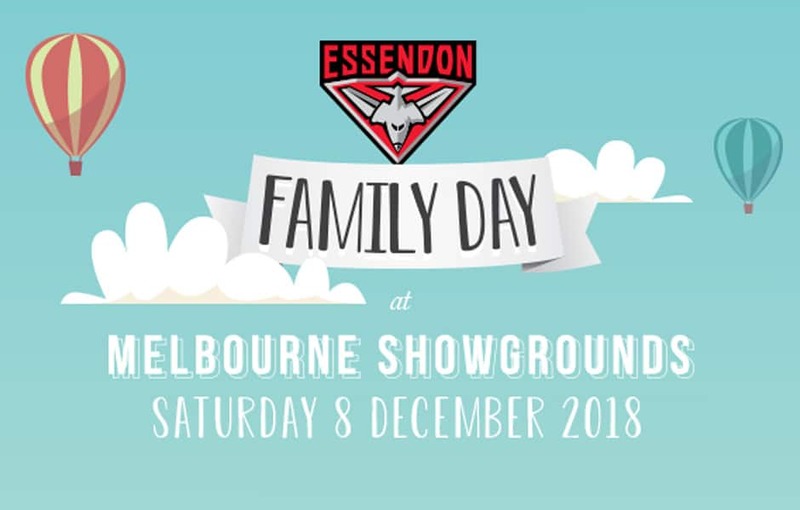 There will be the opportunity to line up in the five different lines and each line you will receive nine players’ signatures..
Use the hashtag #EFCFamilyDay to share all of your family day fun on Instagram and Twitter. The best images will be used and shared across our @EssendonFC channels! - All day ride pass. $15 for members and $20 for non-members (6 rides available on the day). - $5 ride ticket per single ride. - Laughing clowns game, $5 per game with each child winning a prize. - Face painting at the Purple Bombers marquee. - Food vans/ trucks with ample seating. - Merchandise and membership sales. - Santa photos at the Amart marquee. Chance to win an Ultimate ANZAC DAY experience – 2 reserved seats to the blockbuster Anzac Day Match Essendon Vs Collingwood 2019 with 2 post game change room passes plus other prizes. Trade in any old Bombers guernsey and receive up to 20% off a new 2019 Amart home or clash guernsey (10% off for 2019 non-members). All guernseys traded Family Day will be donated to the Bombers’ charity partner Boots for All.